This is Part 2 of the Silent Rave I attended on Friday night. 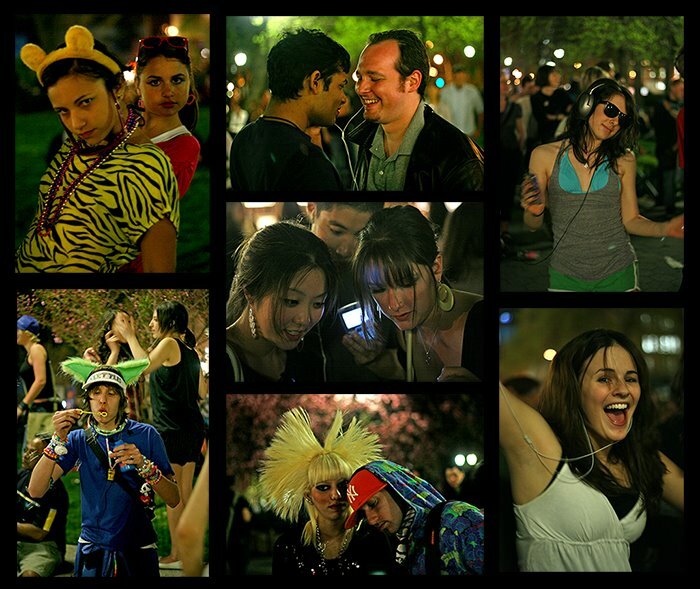 This type of event can also be described as a silent disco, silent party or mobile clubbing. The concept of silent discos goes back to the 1990s. Some of these may take place as a flash mob - see my posting on the recent Pillow fight in Union Square for more about flash mobs. Friday's silent rave was organized by Jonnie Wesson, an 18 year old exchange student from Britain, attending the Packer Collegiate Institute in Brooklyn. Silent raves are popular in London and Europe - large scale silent discos with thousands of participants have taken place in the U.K.
“The basic premise is that a hundred or a thousand or a few thousand people all turn up in a public place, turn on their own headphones and dance" says Wesson. “It’s always fantastic and weird to see thousands of people dancing silently. It’s always in a public space, but it’s not meant to cause disruption, but only because it’s the last place you’d expect that sort of thing."